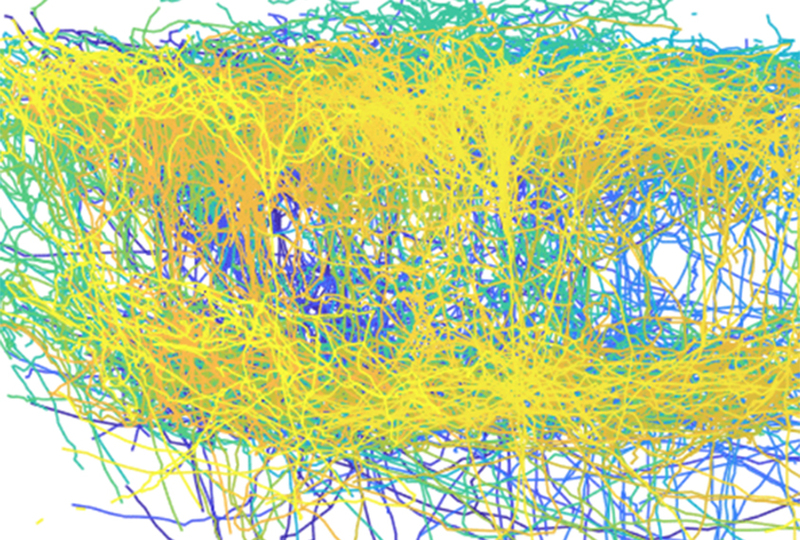 Uncharted territory: Networks of individual neurons form this blueprint of a visual brain region. Using two existing techniques, researchers have traced the routes of hundreds of individual neurons in the visual regions of the mouse brain1. The resulting map shows how information flows in the brain. It could help researchers pinpoint alterations in neuronal networks in mouse models of conditions such as autism. Researchers can use glowing proteins to tag neurons and track their paths through the brain. But this technique enables them to trace fewer than 10 neurons at a time and takes years to complete. In the new study, researchers used this method along with one called MAPseq, which they developed in 2016. MAPseq enables researchers to map the paths of hundreds or thousands of neurons in a matter of weeks. In this method, researchers inject neurons with fluorescent viruses toting any of billions of unique molecular tags. The tags are sequences of RNA that combine in different ways. A protein within the virus transports the RNA barcodes down the length of the neuron to another cell, often in a different brain region. When researchers dissect and slice the mouse brain, they can extract the RNA and sequence it. They can then match each RNA label to its neuron to quickly determine which cells connect to each other. Using the traditional approach, the researchers traced the axons of 31 neurons from the primary visual cortex to 18 target areas, an effort that took three years. Then, using MAPseq, they traced 553 axons to six target areas — in only three weeks. Of the neurons tracked with simple fluorescence, 23 (77 percent) extended to multiple locations, almost all of them outside the primary visual cortex. Using MAPseq, the researchers found that 44 percent of the neurons projected to more than one area. The researchers found six patterns of connections that apply to 73 percent of the neurons, pointing to the existence of set pathways in the brain. The findings appeared 5 April in Nature. The researchers plan to use MAPseq to create whole-brain connection maps for several animals, including mice, rats and monkeys. They hope to eventually do the same for various animal models of autism and other brain conditions.